If you fly to Asia with any frequency, and you care about service and quality, you’ll probably want to build a relationship with Cathay Pacific, Hong Kong’s flag carrier. It ranks among the most luxurious airlines in the world. In addition to receiving a five-star Skytrax rating, it has been recognized as the World’s Best Airline more times than any other carrier. Cathay Pacific serves 200 destinations in 52 countries and flies to five cities in the U.S.: Boston, Chicago, Los Angeles, New York and San Francisco. The airline is also a member of the oneworld alliance, and has its own network of airline partners. So you can use Asia Miles, the airline’s loyalty program, to fly just about anywhere. 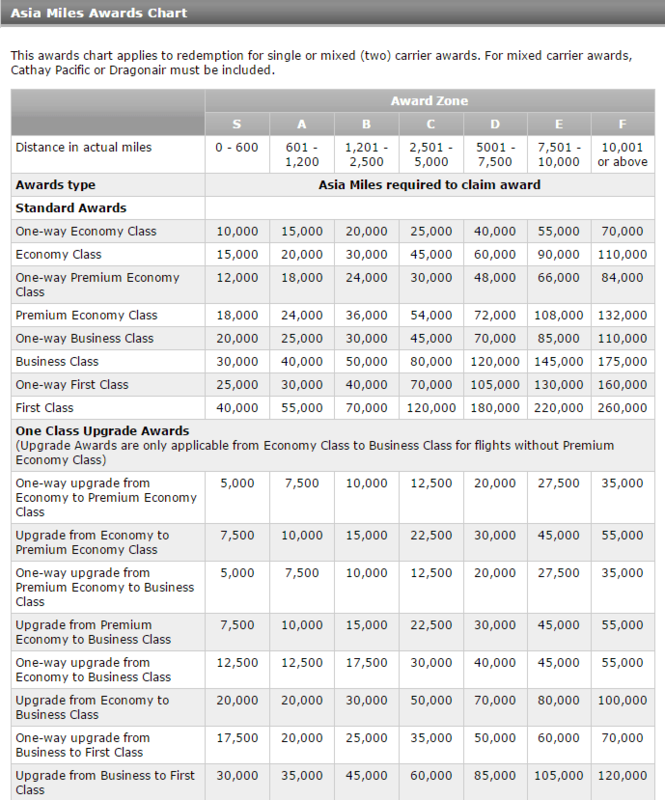 When Should You Use Cathay Pacific Asia Miles Awards? Cathay Pacific’s subsidiary, Dragon Air, serves 44 destinations from its Hong Kong hub, further extending the airlines’ intra-Asia network. It’s also a fully affiliated member of the oneworld alliance. Even though Dragon Air positions itself as a budget airline, it offers comfortable aircraft with excellent service and full business class amenities, even on its short flights. In addition, Cathay Pacific’s new long-haul premium economy class is among the best in the industry, and it doesn’t cost that much more than standard coach. 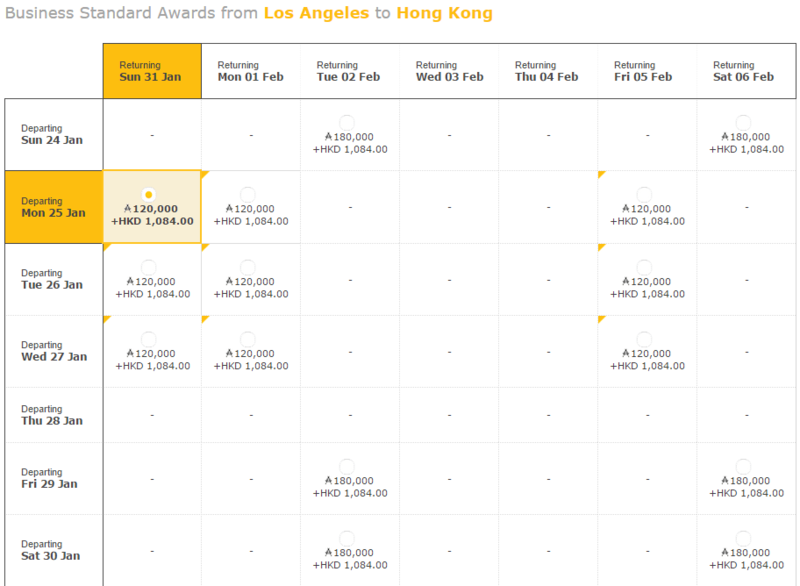 It’s just 12,000 miles more to upgrade to premium between Los Angeles and Hong Kong. While award levels on Cathay Pacific’s own flights are good, Asia Miles offers terrific redemptions on oneworld partners, especially in business or first. 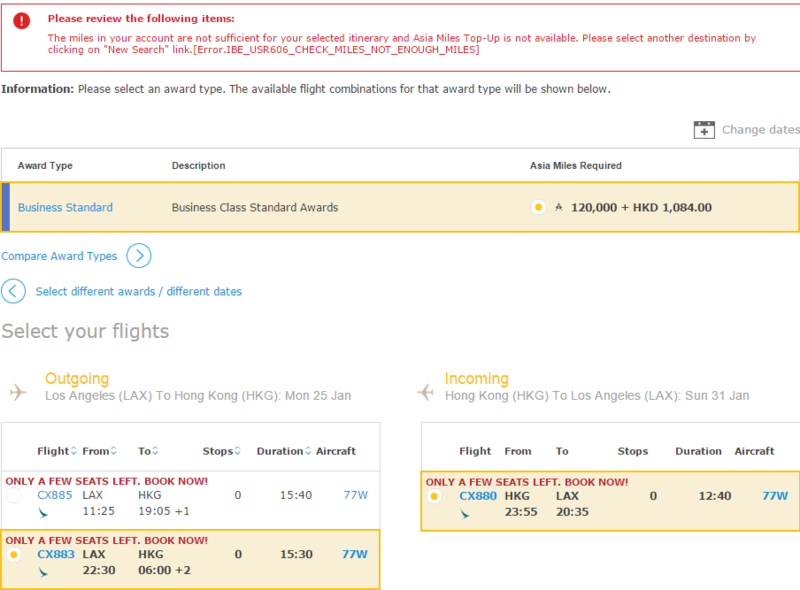 A business class ticket on Cathay Pacific between Los Angeles and Hong Kong falls into Asia Miles award Zone D (5,000 to 7,500 miles) and costs 120,000 miles per roundtrip. Yet, a longer flight between Dallas and Hong Kong, which falls into the multicarrier award Zone 6 (7,501 to 9,000 miles), costs only 85,000 miles in business class. There are many excellent deals on the multicarrier oneworld alliance award chart. Long-haul redemption rates are particularly good, especially for business or first class. A roundtrip flight between Los Angeles and Sydney in business is 85,000 miles, and 115,000 miles in first. You can also fly roundtrip between the U.S. and southern South America for 80,000 miles in business and 105,000 in first. 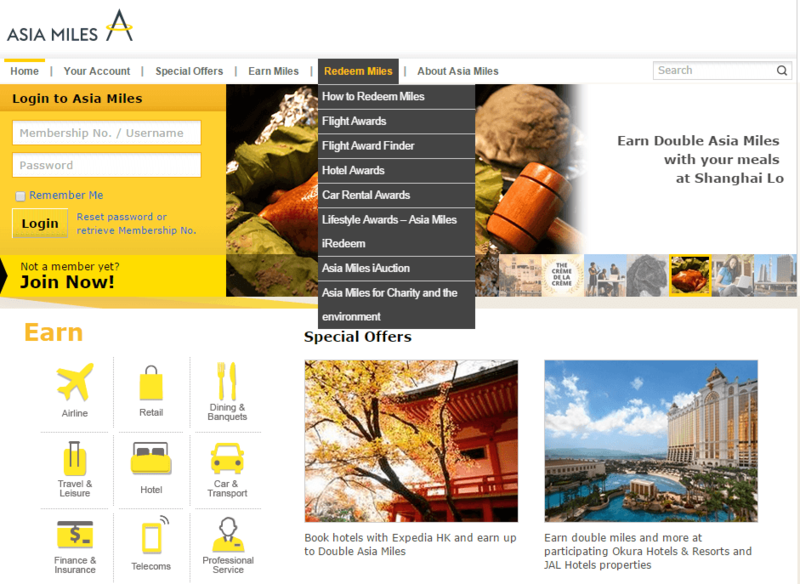 Click on the “Asia Miles Travel Services Limited online booking website” link in the second paragraph. You’ll be prompted to log in to your account. You can use Cathay Pacific’s Asia Miles Top-Up to purchase miles if you don’t have enough to get an award ticket. You have to have at least 70 percent of the miles, though. Cathay Pacific’s U.S. call centers are open Monday through Friday from 6 a.m. to 5:30 p.m., and Saturday from 6 a.m. to 4 p.m., Pacific Standard Time. 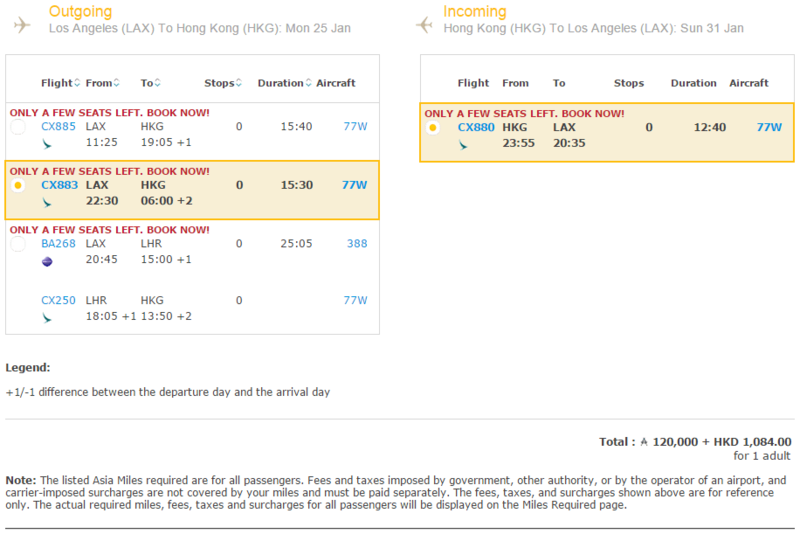 Cathay Pacific’s booking website has its limitations. You can’t book many partner airlines or any multicity itineraries online, and sometimes you’ll receive error messages for no apparent reason. The airline definitely flies that route, and it’s unclear why this message sometimes occurs. In this case, you’ll have to call to book. The airline also allows you to fill out an online request form for award flights. If you do that, an agent will contact you within a week to confirm the booking. If you can wait, this is probably the best option, since there is frequently a long wait when calling. You can also try contacting Cathay Pacific’s social media team on Facebook or Twitter if you need additional help. Reduced cost companion tickets available in first or business class.